The holiday homes at Résidence Les Terrasses de Fort Boyard are spread over two buildings with two and three floors. They both have a lift to the 2nd floor. We offer several types of apartments for 2 to 6 guests. 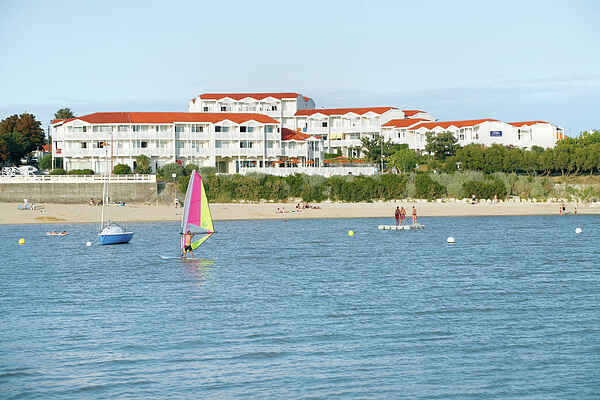 Some apartments have sea view and overlook the islands of Ile d'Aix and Ile d'Oléron. Studios for 2-3 persons (23m²) (FR-17450-04) with a sofa bed for 2 in the living room and an alcove with a bunk bed. For 4 people (30m²) (FR-17450-02), an apartment with sleeping accommodation for 2 people and also a separate bedroom for 2 people. Also for 4 people (30m²)(FR-17450-07), an apartment with sleeping accommodation for 2 people as well as a separate bedroom for 2 people. A view of the ocean or the swimming pool. Slightly larger apartments for 5 people (38-42m²)(FR-17450-03) with sleeping accommodation for 2 in the living room, a separate bedroom and two single beds on the mezzanine. Apartments for 5 people (38-42m²)(FR-17450-05) with sleeping accommodation for 2 in the living room, a separate bedroom and two single beds on the mezzanine. A view of the ocean or the swimming pool. There are apartments for 6 people (48m²)(FR-17450-06) with sleeping accommodation for 2 in the living room and two separate bedrooms, each for 2 people. A view of the ocean or the swimming pool. The completely renovated studios and apartments are comfortably furnished, and feature a balcony or garden with patio furniture.